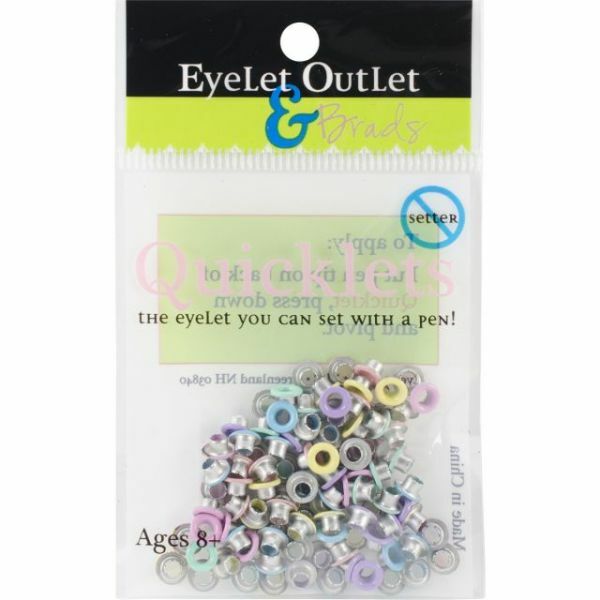 Eyelet Outlet Quicklets Round 84/Pkg - EYELET OUTLET-Quicklets. Eyelets to the right, brads on the left. Eyelets at the top and even on the bottom. Eyelet Outlet is one of the largest suppliers of eyelets for scrapbooking, card making and so much more and that is why they are able to create an Quicklets: an eyelet that is manufactured with the slits already in the back of the eyelet, making it easier than ever to use, so easy you could use a simple plastic pen to set them. They have 100's of bright, cheerful, fun eyelets, there is sure to be 1 or 20 that strike your fancy! Size, shape, color and number of eyelets per package varies by theme. Imported.